ESR | April 13, 2015 | How much longer can OPEC hold out? Simply put, the world has too much oil at the moment which has resulted in the reduction of price levels from approximately $100 to $50 a barrel, and OPEC (as well as US shale producers) has a major role to play in this supply glut. 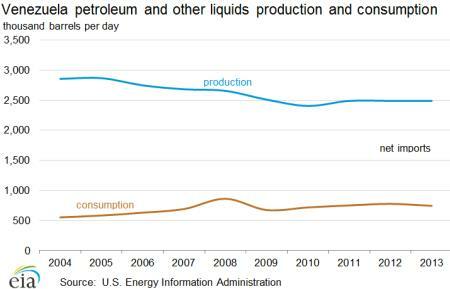 With the decline of average annual crude prices, OPEC earned around $730 billion in net oil export revenues in 2014 (Source: EIA), a big decline of 11% from its previous year. 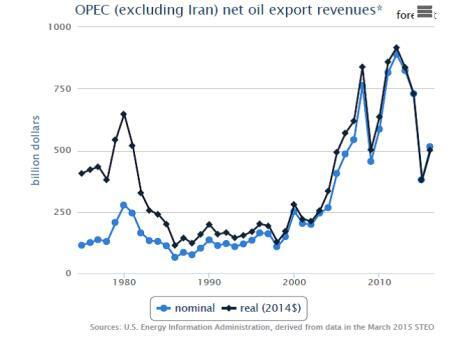 The EIA even predicts that OPEC's net oil exports (excluding Iran) could fall to as low as $380 billion in 2015. Cheap oil has created a huge financial crisis for Venezuela as its economy is heavily dependent on oil exports and oil revenues constitute about 95% of its total foreign exchange earnings. As per its state run oil company PDVSA, the country loses about $700 million a year with every $1 drop in the international oil price. For a nation that is suffering from shortage of basic requirements such as food and toilet paper, any further reduction in oil prices would result in a total economic collapse. Therefore, it would be in Venezuela's interests to reduce its production levels especially after the Iran nuclear deal. Nigeria is Africa's largest oil producer and among the top 5 global exporters of LNG. An OPEC member since 1971, Nigeria's oil and gas sector represents about 75% of its total government revenues and 95% of its total export revenues. The African nation's economy is heavily dependent on crude oil prices as its foreign exchange reserves (built as a result of net positive oil revenues) have reduced substantially over the past two years. After Saudi Arabia, Iraq is the biggest crude oil producer in OPEC. It also has the fifth largest proven crude oil reserves in the world. With an increase in its government budget spending, the country requires a stable international oil price of $105 per barrel to achieve its break-even point. The current oil price levels are nowhere near this. Apart from this, issues such as the ongoing ISIS insurgency, western sanctions, heavy economic dependency on oil (more than 90%) and poor infrastructure have added to Iraq's woes. 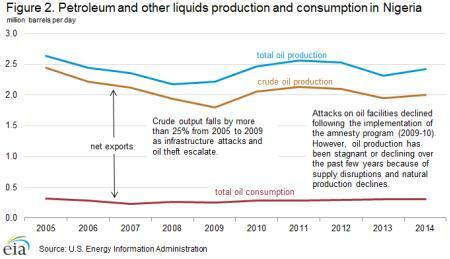 Apart from being the largest exporter of the total petroleum liquids in the world, Saudi Arabia is also the main driving force behind the cartel's stubborn supply policy. The Saudis, along with Kuwait and UAE have been defending the decision of not reducing the OPEC production levels in order to retain their global market share. It is interesting to note that even if the oil price remains at the current levels, Saudi Arabia, Kuwait and UAE would have enough cash reserves to remain in the game for several years. Last year, Saudi Arabia's oil minister Ali Al Naimi said "It is not in the interest of OPEC producers to cut their productions, whatever the price is." A number of mitigating factors make this year's June meeting of OPEC more interesting than ever. Gaurav Agnihotri is a writer for Oilprice.com where this originally appeared.